Women from around the world gathered in Rebbetzin Kanievsky’s small kitchen in Bnei Brak, Israel, every Thursday afternoon to watch the Rebbetzin bake her famous challah. 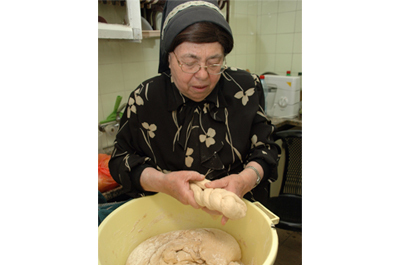 As she kneaded the dough and separated a small piece to fulfill the mitzvah of challah, she began to pray fervently, offering individual blessings for each woman present and for their family and friends. Challah baking with the Rebbetzin was truly a heightened spiritual experience. Mindy Rafalowitz, recipe developer and columnist, demonstrates how to make challah with the Rebbetzin's challah recipe. 1. Dissolve dry yeast and 2 tablespoons sugar in 1 cup warm water. Let sit for 10 minutes until bubbly. 2. Place all remaining ingredients into a large bowl. Add the yeast mixture and combine. 3. Knead the dough, adding small amounts of flour if necessary, until the dough is no longer sticky. 5. Punch down the dough. Separate a piece of challah to be burned and make the berachah. Divide remaining dough into 6 pieces (for extra-large challahs or into smaller pieces for additional challahs). 7. Place each braided challah into an oval foil or metal challah pan. 8. Let challahs rise until doubled in size, ½ - 1 hour. 9. Preheat oven to 350 - 375 degrees. 10. Brush challahs with beaten egg and sprinkle with sesame seeds. 11. Bake in preheated oven from 35 minutes to one hour, depending on size of challahs.